The powers that be in Gilead see some growing pains after last week’s explosive cliffhanger. Spoilers below! 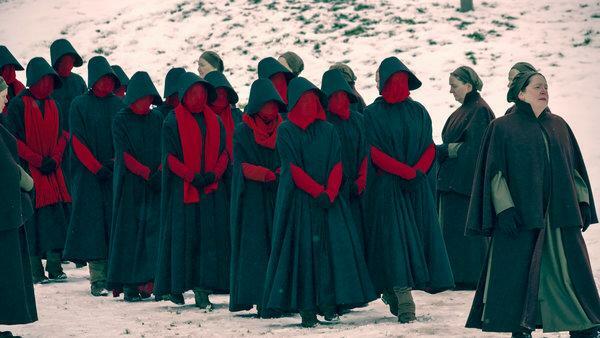 At the beginning of this week’s episode, After, I was excited to see the handmaids carrying multiple caskets. Surely, I thought, these were the bodies of the commanders who died in last week’s attack on the new Red Center. And there were a lot of them! The schadenfreude was strong with me! But we had no such luck. The bodies were those of the handmaids who died in the resulting chaos, instead. In fact, it appears that many of the commanders are still alive, though many are in critical condition. Among those bedridden include Commander Waterford, whose debilitating injuries have created somewhat of a Game of Thrones-esque power vacuum in Gilead. One of the big parties vying for this power is Greg Bryk’s Commander Cushing. As a big Ubisoft fan, I was excited to see this character finally step out of the shadows a bit and begin to show shades of Bryk’s portrayal of “The Father” Joseph Seed from this years’s Far Cry 5, in that both characters are now major and menacing figures in horrifying cult-like organizations. And Bryk succeeds in not only bringing a new type of villain to the show, but a very new conflict as well. While previously the conflict on the show has mainly focused on June’s relationship with the Waterfords, Cushing adds a third major party, a villain who is trying to bring down not only June but the entire Waterford house itself. Cushing interrogates both June and Serena, and it’s clear that he intends to prove that June’s earlier rescue was an inside job and that there is a conspirator among the Waterfords- perhaps even that it’s Fred Waterford himself. The threat of what this could mean is made clear earlier in the episode, when we see that the Eyes have executed multiple households by hanging for suspicion of being involved in Ofglen’s attack on the Red Center. Given this obvious threat, June and Serena appear to both realize that their fates are tied, and that they may have to put aside their petty squabbles to deal with this far more pressing issue. In Canada, Moira and Luke learn of the attack of the Red Center. Moira, concerned with learning of June’s status, begins to pour through documents to see what is going on in Gilead. Luke, meanwhile, seems less than concerned. The intent, I guess, is to cause some tension and make it seem like Luke no longer cares for Offred, but after Moira’s efforts prove difficult anyway, we are lead to believe that Luke has simply become disillusioned with any efforts of investigating events in Gilead. In addition, Moira has some flashbacks. It’s certainly an interesting twist that she was once a surrogate mother, and the story itself is fine, but it just feels like a sub-par episode of Lost, in that these scenes feel really disconnected from the episode’s narrative. In the end, the people in Ontario discover the true victims of the attack (June obviously not being among them), but this entire part of the episode just seemed like filler to me. In another thread, we see Janine and Emily returned from The Colonies, given the apparent lack of handmaids after the attack on the Red Center. I’m happy to see them back, but I think this kind of raises some interesting questions about The Handmaid’s Tale‘s world-building. The Colonies are supposed to be a point of no return, so clearly it’s a big move to bring handmaids back from there (especially ones who are considered terrorists). Surely if there are other cities in what was formerly America, there have to be a dozen spare handmaids among them, right? Not so much that you’d have to resort to effectively removing people from Death Row? Or is Gilead a single city, or small collective of city states? Is it really not as big as we might think it is? If not, why has another developed nation (like Canada) not intervened in this obvious humanitarian crisis? I don’t mean to be overly critical, and I ask only because I care. I think that this type of world-building would be really interesting to know about in this story’s context. So far, the story has been a smaller, more personal affair. But, given Cushing’s moves against the Waterfords, I think it looks like the scope of the show is about to widen quite a bit, and I sincerely hope the lore can keep up with it. The episode doesn’t have quite the act of violent defiance that last week’s did, but there are two smaller rebellions that we see. The first is when June discovers Emily and Janine’s return from the Colonies while at the market with them. She’s inspired to begin revealing her true name to the handmaids, who in turn begin to all tell each other their own names. 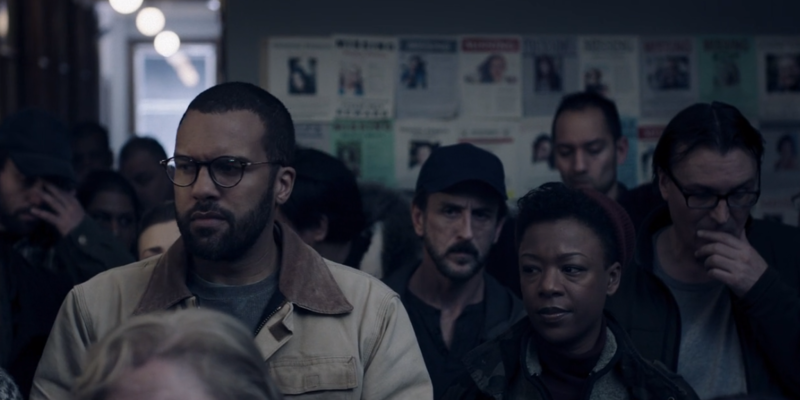 It’s a beautiful moment that finally gives the handmaids back some of the agency that’s been robbed from them, but I’m concerned that Eden, who was also at the market, may not be as impressed. Second, we see that Serena has forged new orders for the Commanders. She asks June, formerly a copywriter, to edit them, so as to make them as convincing as possible. With a click of her pen, much like the click of Ofglen’s detonator, June sets to work. Next week we might see if the pen is mightier than the sword… well, bomb, but you get the idea.